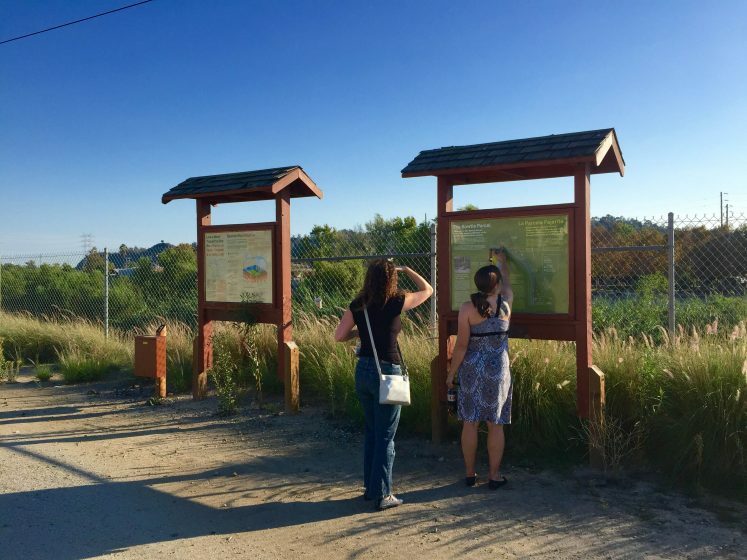 A review of Rosten Woo’s “Bowtie Nature Walk,” available at the Bowtie Parcel on the east side of the Los Angeles River’s Glendale Narrows. A map and tour audio files are available here. A “nature walk” seems like an unlikely activity to find on the industrial banks of the Los Angeles River. From the vantage point of a 70-mile-per-hour car crossing the moat between east and west Los Angeles, there doesn’t appear to be much “nature” on the river’s cavernous concrete floor or walls. 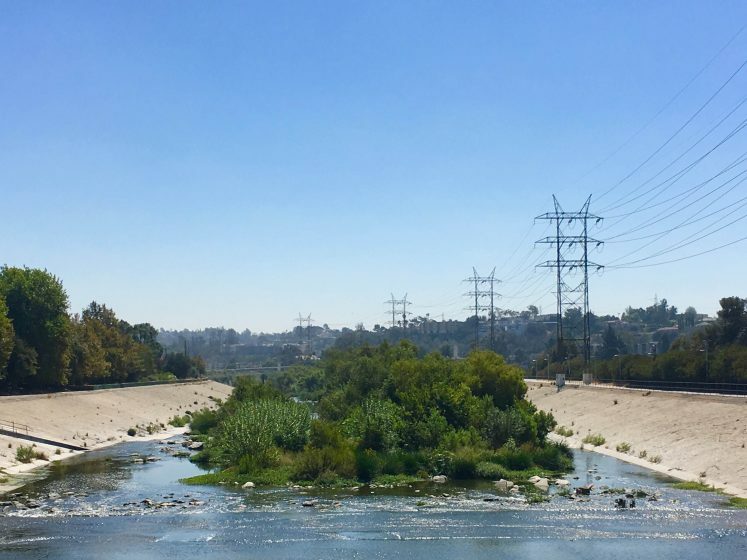 The Bowtie Nature Walk asks vital questions about the current plans for the Los Angeles River: namely, whether they will lead to a recognizable “river,” or the opposite. But to those who live alongside, recreate on, work with, or otherwise get up close to the river, its ecological complexity is undeniable. The persistence of certain plants and wildlife in the concrete channel, despite no natural hydrology, has undoubtedly inspired Los Angeles River revitalization efforts. This is the audience I suspect artist and designer Rosten Woo had in mind while creating the “Bowtie Nature Walk,” the second of three installations intended to bring the less-visible aspects of the Los Angeles River ecosystem to the surface. Woo’s audio tour piqued my interest because a few months before its release, I got up close to the Los Angeles River myself. Very close. For six days, I walked the river’s entire urban reach, from Canoga Park in the San Fernando Valley, to the Pacific Ocean in Long Beach. While traversing both sides of the 51-mile channel, I observed things well known to river advocates—mainly that the river is a dynamic landscape. But I reached the river’s terminus with its sweetly acrid aroma baked into my skin, and more questions than answers about its future. Several months later, Woo’s nature walk gave shape to these questions. In ten audio segments, less than four minutes each, Woo’s narrators peel back layers of the river’s socio-ecology. Each segment corresponds with a modest wooden marker poking above clumps of fountain grass throughout the Bowtie Parcel. Also called G1, the parcel was purchased from Union Pacific Railroad by the California State Parks in 2003 for $10.7 million, to create a 100-acre river park. 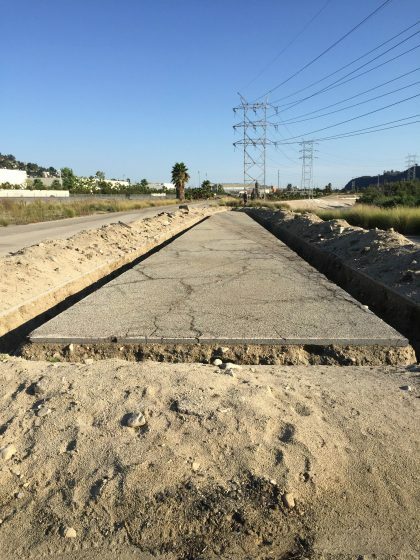 Located within the soft-bottomed Glendale Narrows, and with a shape squeezed and pulled into a bowtie by surrounding infrastructure—freeway, rail tracks, and river channel—it is an ideal lens through which to view the river’s past, present, and future. The Bowtie Parcel is a microcosm of the ecological, social, and political factors influencing the Los Angeles River corridor and basin. Each narrator explores a piece of the River’s story through found cultural artifacts. With a variety of spoken accents, the narrators represent the diverse communities surrounding the river and shaping Los Angeles’ cultural vibrancy. The one-mile audio tour loops around several large-scale land-art installations from previous public programs conducted by Woo’s non-profit collaborator, Clockshop. These artifacts are enduring symbols of the perpetually unfurling, emergent culture inspired by the Los Angeles River. A grove of Mexican Fan Palms growing between Nelson-Miller’s warehouse and the river channel is the subject of the tour’s introduction. The narrator discusses how palm trees have become a label, perhaps the label, for Los Angeles. She quotes the California author and architecture historian Esther McCoy, who once called palms “a symbol of the city’s indolence; shallow rooted, constantly on the move, shifty, shiftless, with no sense of place.” Los Angeles has since adopted a policy to not replant palms—native or non-native—as they reach the end of their natural lives. 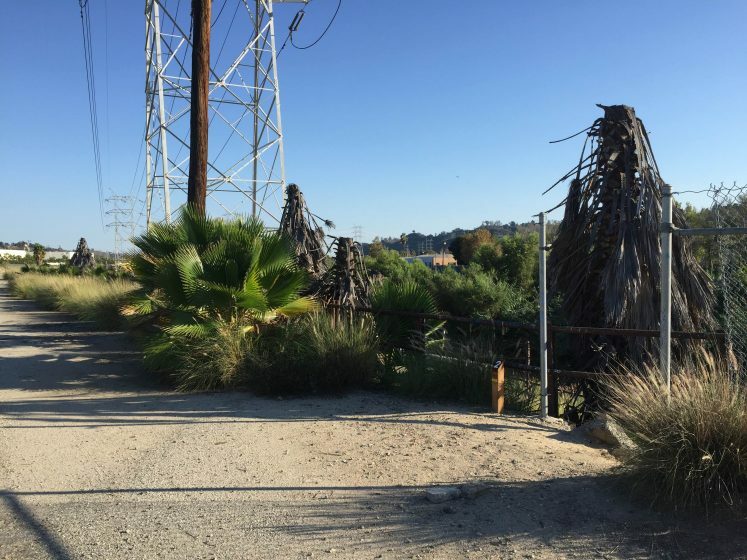 Someday, the palm trees along the Los Angeles River will all be gone, including an indelible grove I discovered on day two of my river walk. Wedged between the Weddington Golf Course and the river channel in Studio City, one finds a row of native California palms that have evaded annual frond trimming. Desiccated, brown fans from years past obscure narrow trunks from the ground up to living fronds tufting their tops. I hadn’t noticed “natural” palm trees like these before on my walk, but their juxtaposition with the stark concrete channel forced me to pay attention. Instead of bare, thin pencil trunks, I found columns displaying everything they’d grown. Much as the rings inside deciduous trees visualize a historical record of growth, these Fraggle-like creatures animating the edge of the concrete river wear their history like so many layered dresses. This was the first moment on my river walk that I felt I was somewhere; I was in Los Angeles. The 12 walking hours before this “palm experience” could have been in any suburban landscape. The Bowtie Nature Walk left me wondering: how much of the decision to not replant palms is a reaction to their acquired symbolism rather than the palms themselves? Will Los Angeles be less indolent, more rooted, or less shiftless without palms? Or will the absence of palm trees lead to no label for Los Angeles at all? Perhaps a palm-less Los Angeles will be a label-less, or place-less, Los Angeles. One audio segment examines the only native plants remaining on the Bowtie Parcel. Mulefat, California buckwheat, and sage, in addition to natives that have not lived there for decades, will be prominent in a restored Los Angeles River. Day one of my river walk provided a snapshot of this native river vision. As I trekked along the newly constructed San Fernando Valley River Greenway, the path snaked between the river channel and discriminately designed plantings of native California sage, wild rose, laurel sumac, and sugar brush. Although they provide preferred habitat for native birds and other wildlife, these plantings will always require extensive maintenance to defend them against aggressive non-natives. The Bowtie Nature Walk weaves through the non-native and “invasive” fountain grass blanketing much of the river landscape. Listeners are encouraged to visualize removing millions of fountain grass clumps dotting the foreground and horizon and the seeds that stay viable underground for up to seven years. 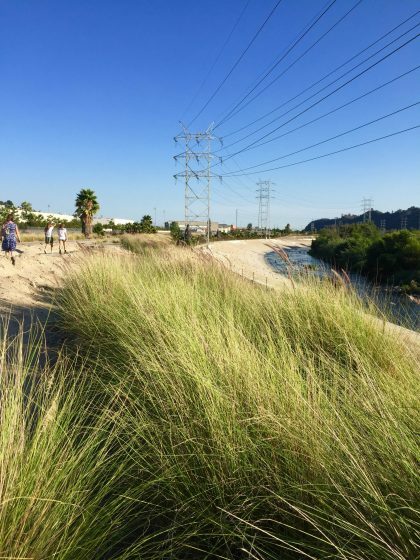 Like similar exotic species that out-survive natives with greater adaptability, the fountain grass will need to be eradicated from the Los Angeles River basin to construct a native river landscape. Another exotic and invasive species residing in the river channel set day three of my river walk apart from the others. After two days pounding the hot, barren, ceaseless sea of river concrete, I approached the soft-bottomed Glendale Narrows. A green haze on the horizon was the first sign of vegetative life in the river channel. I sprinted a few hundred feet, anticipating the relief of a temperature drop. There I stood and applauded this symbol of nature’s dynamism. Giant reed grass—Arundo donax—is thriving in the harsh Los Angeles River. I would later learn from the Bowtie Nature Walk that giant reed grass is reviled among river advocates. Its habitat value for native wildlife is reportedly low and its rapid growth—up to four inches a day—outcompetes native species. But Arundo has found a luxury home in the Los Angeles River. It can depend on natural and human disturbances, such as annual floods and continual attempts at removing it, to break and release stem fragments that propagate elsewhere. Downstream drains and islands of trash and debris characterizing the Los Angeles River are the perfect nooks and crannies for fragments to lodge and sprout new, vibrant colonies. The plant even feeds on heavy metals common in the river water, absorbing them through its roots and storing them in its stalks and leaves. Arundo is also being studied for carbon sequestration of degraded soils associated with desertification, although I haven’t found research on this specific to the Los Angeles River. Giant reed grass thrives off the human excesses of the contemporary Los Angeles River. It is a species symbolic of the Anthropocene, confirming that stability in nature is an illusion and humans are inseparable from the ecological equation. The Bowtie Nature Walk left me with many Arundo-inspired questions. Perhaps when we focus on the negative aspects of a species, we miss out on its industrious side. One Bowtie Nature Walk segment links a belief in native plant superiority to the Nazis. The first and most vocal proponents of native horticulture, the Nazis were obsessed with creating “pure landscapes” along the Autobahn, free of foreign intruders. Woo uses this example to suggest what the eugenics of native horticulture symbolizes about our attitude towards nature. One narrator states, “Fear of the non-native combines two contradictory impulses: the celebration of our landscape before human intervention, and the fear of nature beyond human control.” Proponents of re-creating native landscapes want to return to a pristine nature no longer possible in the Anthropocene. But attempting to do so requires unending human intervention to keep foreigners out. Meanwhile, examples like giant reed grass suggest that nature has other ideas about cleaning up our messes. Native willows, cottonwoods, and sycamores mingle with non-native black locusts, tree of heaven, and eucalyptus. The lush mass of trees and shrubs replaces the heavy mat of concrete previously lining the bass, catfish, and carp-filled stream. Moving further into the basin, I passed between golf courses on both sides of the river, where maintenance crews mowed and fertilized meticulously manicured fairways. I strolled past bonsai dotted gravel terraces being raked smooth in a Japanese Garden. I ambled through the wildlife reserve, where maintenance crews replaced acclimated non-native plants with native ones. Waterfowl, shorebirds, and other small birds swam in a lake filled with reclaimed water from the nearby Tillman Water Reclamation Plant. These recreation areas provide room for a 100-year flood event. The iconic Sepulveda Dam at the easternmost end of the basin ensures that prospective floodwaters don’t move beyond their carefully engineered boundaries into the city beyond. I named river walk day one The Archetype. The engineered Bell Creek and Arroyo Calabasas merging to form the river, and the 405 and 101 freeways merging to force the river back into its concrete edition prior to Sepulveda Basin, epitomize the Los Angeles River. Although most of its uses require intensive gardening, Sepulveda Basin is a snapshot of the river when it had room to pour out beyond its banks, depositing rich alluvial soils and recharging underground aquifers. The channel leading into the basin exemplifies the halt of these ecological functions to protect human settlement. 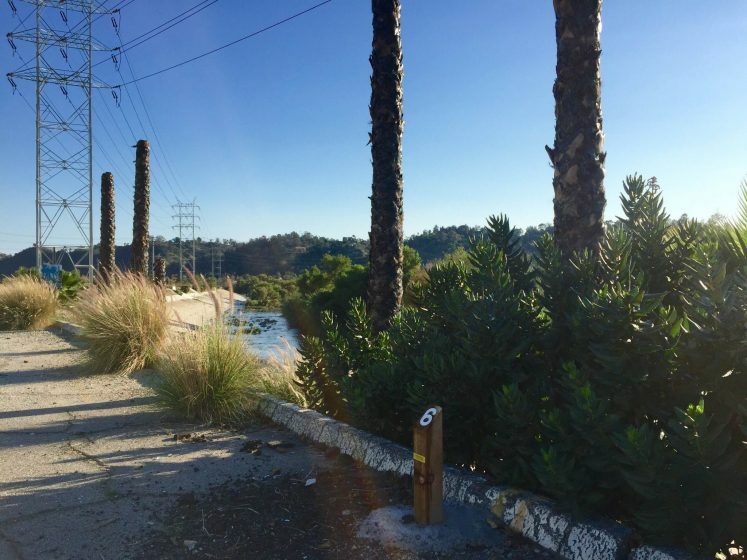 The new San Fernando Valley River Greenway exemplifies the river’s future, with continuous pedestrian access and a re-nativized riverbank. One audio segment of the Bowtie Nature Walk asks the question, “What is a River?” Various versions of “river” from my walk came to mind. Is a river the concrete channel that has been fixed in place for the past 60 years? Is a river the softer, wilder version that momentarily flows through Sepulveda Basin, with room to flood only in catastrophic events? Is a river new courses carved each year, flooding the delta with rich soil and recharge water? For nearly 50 years, the Los Angeles River was called a “flood control channel.” Through tireless advocacy efforts, that term has universally been replaced with its historic descriptor, “river.” This change in language acknowledges that Los Angeles has a river at all, and in doing so reclaims the channel as public asset—and, consequentially, makes it available for public access. It is as much a shift in words as it is a shift in consciousness. A long forgotten landscape slicing through the region is now accessible by everyone. But it does beg a question asked by the Bowtie Nature Walk: to what version of “river” is the Los Angeles River now being restored? Woo’s narrator suggests that if steelhead trout are to return to the Los Angeles River—one metric of restoration in current plans—the concrete banks need to be removed and the flow of water from treatment plants rerouted away from the river. It would again be seasonal and wild, as it was 70 years ago, when the steelhead trout called it home. But that would require restoring a surrounding Los Angeles; relocating homes, industry, and infrastructure for a wider flood zone. The narrator explains that as a real estate vision takes the helm of restoration efforts, other visions fade, and new development abutting the river channel will make a restored vision impossible. 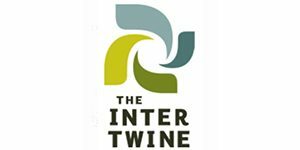 The Bowtie Nature Walk asks whether current plans will lead to the opposite of a restored river. Will the final result be restored access and high maintenance native plantings—but not a restored hydrologic system—because that would require a restored city to match? I wonder, then, whether the former result is a “river” or something else entirely? By continuing to call it a river, perhaps we are chasing a mirage—an optical illusion of what was lost, rather than what has become or what will be. One thing I have learned about Los Angeles during my short time calling it home is that the city values challenging questions posed by artists and activists. In Lewis MacAdams’ lifetime artwork, he asked, “to whom does the river belong?” Rosten Woo asks in his river artwork, “for whom or what is river restoration?” Time and advocacy have provided the answers to MacAdams’ question. But Woo’s questions will be answered as river restoration unfolds. The Bowtie Nature Walk prophesies two very different answers to Woo’s question, based on the outcomes of two distinct choices: abandon enough of the city to make room for a restored river, or proceed with current plans, knowing that they will not produce a restored river, but something else entirely. Neither of these choices acknowledge the terms of conserving nature in the Anthropocene. The Los Angeles River and its watershed undoubtedly comprise one of the most engineered ecosystems on earth. It is engineered to protect us. As the Bowtie Nature Walk suggests, it is difficult, if not impossible, to undo its engineering. Perhaps an Anthropocene re-making of the Los Angeles River is about engineering it to sustain us, in addition to protecting us. If the Los Angeles River could be as productive as possible, thus lessening the pressure on the rest of Earth’s ecology, what might it look like? Would it be re-engineered to capture every drop of water it currently releases to the ocean? Would its vegetative inhabitants mitigate pollutants, like the giant reed grass does now? 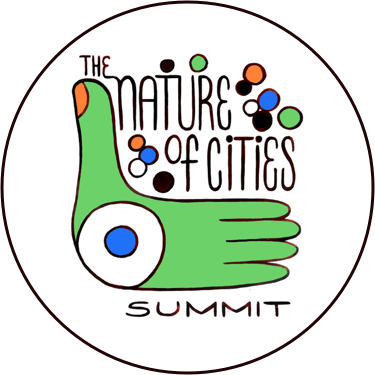 Would the transportation its linearity facilitates be maximized, beyond just recreation? These possible futures may not be the picture of a native, bucolic river landscape, but they may be key for choosing to go forward to nature, rather than going backwards to nature. I hope that there are more artists and activists, like MacAdams and Woo, who continue to make the Los Angeles River the vehicle for their inquiries. It is work like theirs that asks some of the most critical questions about our fundamental role as humans on earth. 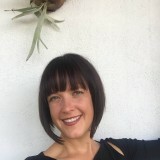 Anne Trumble is a landscape and urban designer based in Los Angeles, where she is currently working with the Arid Lands Institute.